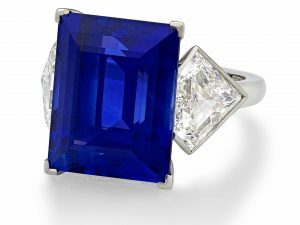 An exceptional selection of rare jewellery, gemstones and objets d’art will be previewed by Hancocks London at Masterpiece this month (28 June-4 July 2018). Masterpiece Fair is London’s premier showcase for art and antiques, with millions of pounds worth of work on sale, and is regarded as the most chic of art fairs in the capital, attracting buyers and collectors around the world. Highlights include an important Van Cleef & Arpels diamond necklace featuring 67 carats of diamonds, a 13.70 carats vintage Asscher diamond ring, a 1920s Cartier desk clock, and an exceptionally rare rose quartz octagonal box by Marchak with mosaic gemstone lid by Vladimir Makowsky. 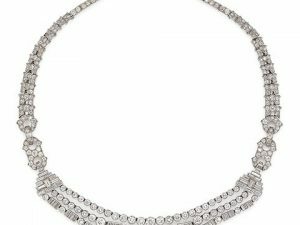 An important Van Cleef & Arpels diamond necklace, dated 1956, formerly purchased by financier Edward Hutton. Truly breath taking and oozing Hollywood glamour, the necklace features diamonds weighing a total of 67.91 carats. 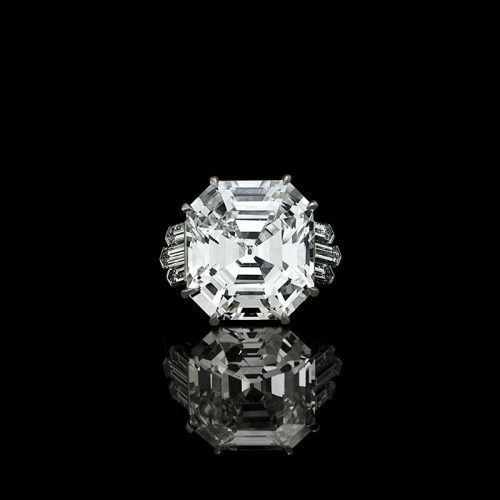 It includes 13 marquise diamond drops weighing a total of 32.22 carats, mainly D colour, of which seven of the stones are potentially flawless and Type IIa – these are the most valued and the purest type of diamonds thought to have originated from the world famous Golconda mines. 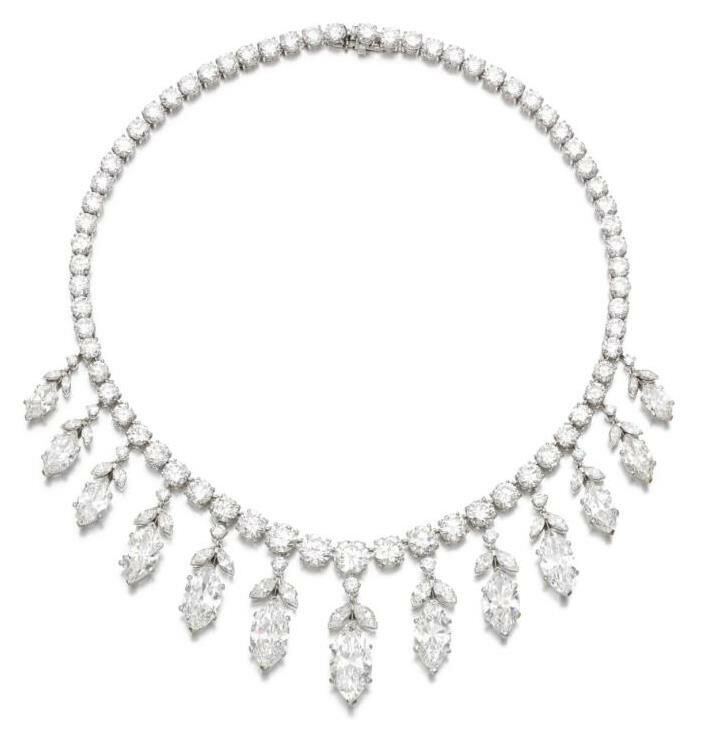 A further 30.33 carats of round brilliants and smaller marquises make up this striking necklace from one of France’s most famous jewellery houses favoured by films stars and royalty for more than a century. The necklace’s former owner, Edward Francis Hutton, was co-founder of E. F. Hutton & Co. E. F. the American stock brokerage firm. This was one of the most respected financial firms in the United States and for several decades was the second largest brokerage firm in the United States. A 12.34 carats Cartier old mine cut diamond ring, circa 1930s. 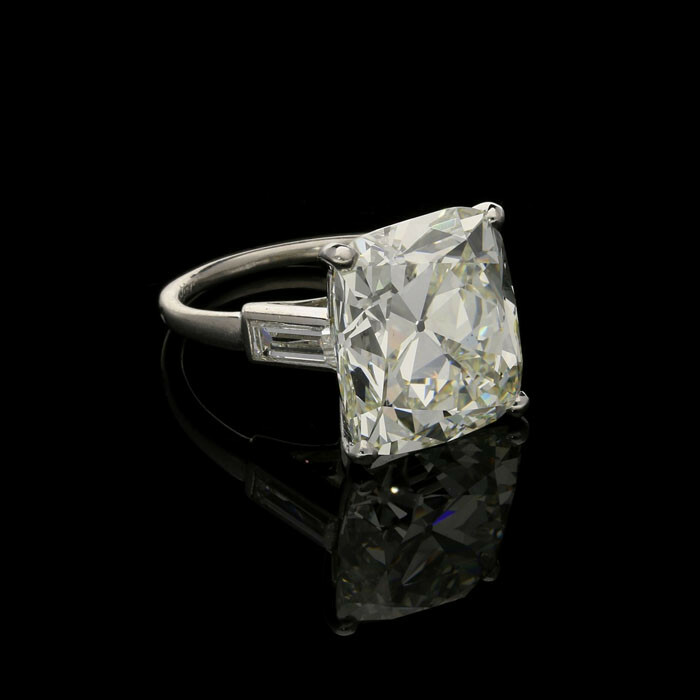 The magnificent cushion cut diamond ring, mounted by Cartier, is set to the centre with a beautiful, lively vintage cushion-cut diamond. A 1920s Cartier desk clock. 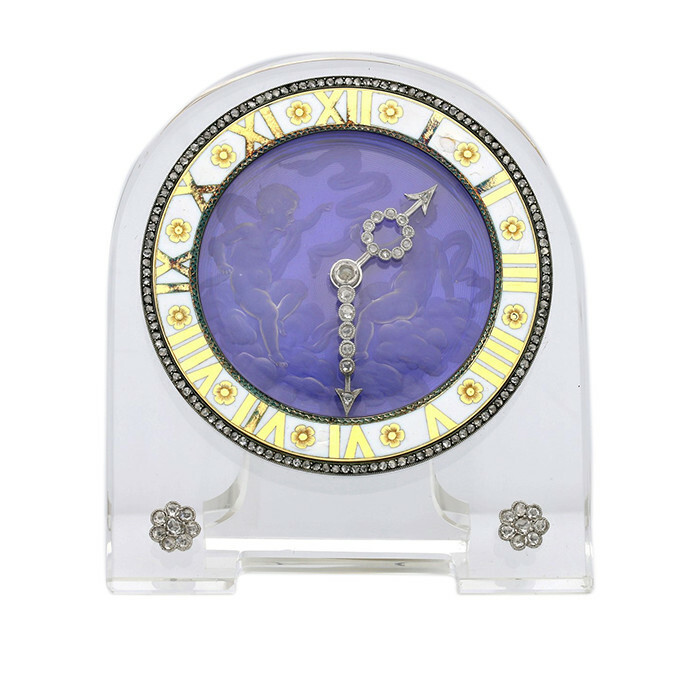 A host of materials – including rock crystal, diamond and enamel – have been used to create the Roman scene on this desk clock by Cartier. Dated circa 1920-1925, its circular face of rich blue enamel overlaid with a reverse carved disc of two putti seated on clouds playing with floating scarves. The dial of white enamel with gold Roman numerals is interspersed with gold flower motifs and edged with a fine row of rose-cut diamonds, with diamond-set hands, all set within a rock crystal frame embellished to the lower corners with rose-cut diamonds flower clusters. 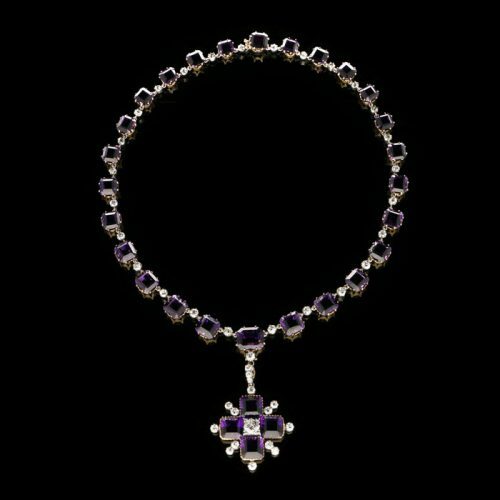 A Victorian amethyst and diamond necklace: This beautiful richly coloured Victorian amethyst and diamond collet necklace boasts a detachable cross pendant. Dated circa 1890, the finely articulated necklace is composed of 26 richly coloured square amethysts in yellow gold settings interspersed with old-cut diamond links. Guy Burton comments: “The Victorian age was a time of classical revival, a harkening back to ancient civilizations including Biblical references, as well as the gothic period in England and France. An exceptional rose quartz and gem-set box by Marchak. Appealing to collectors of objets d’art, this is a rare piece from the Art Deco era, signed by the jeweller who was know as the ‘Cartier of Kiev’, Marchak, in 1925. 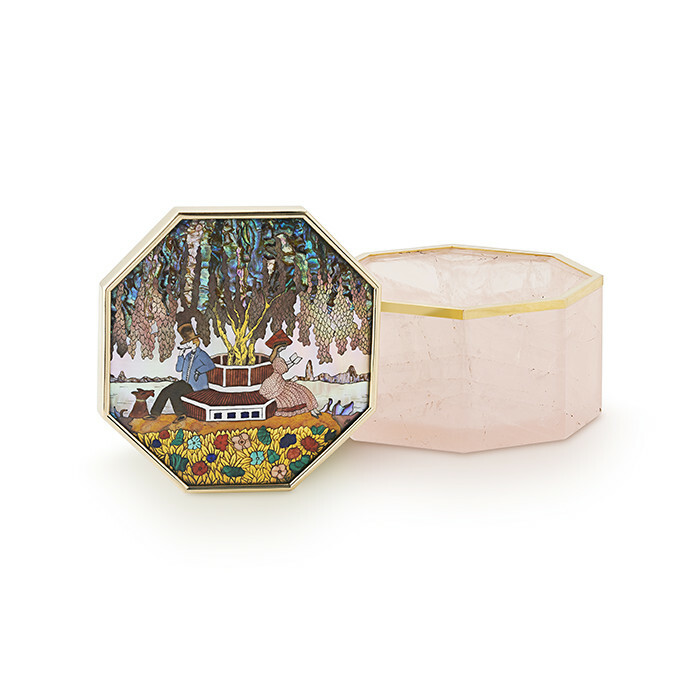 The octagonal box is carved from a single piece of pale pink rose quartz and edged around the top with a rim of yellow gold. The lid of yellow gold inlaid with a panel of exquisitely crafted gemstone mosaic by the master craftsman Vladimir Makowsky. This depicts a landscape with a male and female figure seated on a bench surrounding a large mother-of-pearl wisteria tree under whose hanging boughs they relax, smoking a pipe and reading a book respectively, in the foreground a flower bed of carved gold with flowers in coral, malachite, lapis lazuli and turquoise. A 16.49 carats pair of ‘Eclipse’ earrings by Amy Burton Fine Jewellery. Jewellery designer Amy Burton draws inspiration from sources such as art, travel and sculpture as part of her design process. In her latest creation, Amy Burton has created a pair of avant-garde earrings which seamlessly bring old world and contemporary style together using a pair of old cut diamonds weighing 8.45 carats and 8.04 carats. The diamonds have been beautifully mounted within a black rhodium gold bezel encircled with a row of inverted round brilliant diamonds, set into 18 carat rose gold earrings. The last but certainly not least piece featured in Hancocks London’s highlights for Masterpiece Fair is a striking and highly unusual old cut diamond bracelet from the Victoria era. 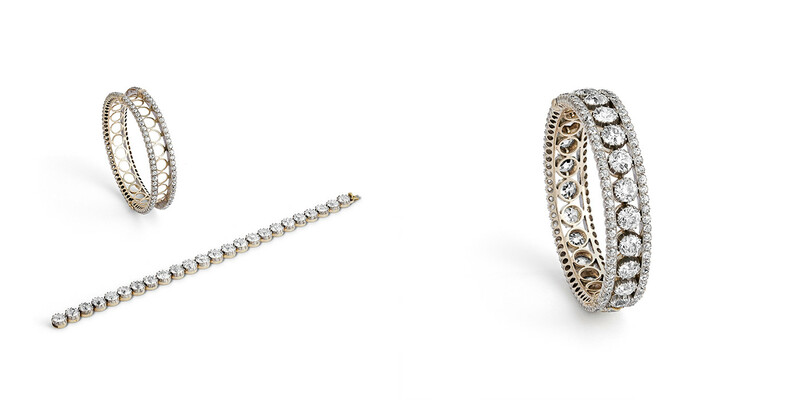 Dated circa 1890, the bracelet is designed as a solid hinged bangle with a central row of 24 large old European brilliant cut diamonds (estimated weight 29.8 carats) set between two outer rows of small old Europeans cut diamonds, all set in silver on gold. Typical of transformation jewellery that was popular in the Victorian era, the central row detaches to form a classically elegant line bracelet of impressive proportions. Hancocks at Masterpiece: Hancocks will be exhibiting at Masterpiece, stand B03. To book an appointment, please call Hancocks on 020 7493 8904. 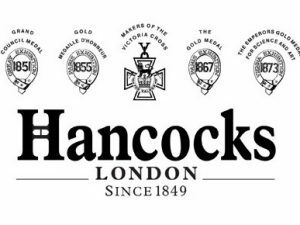 Follow Hancocks on Instagram @Hancocks_London.